Bring a cool touch to your ensemble with these ice cream cone socks. Bring a cool touch to your ensemble with these ice cream cone socks. They feature delicious detail and a smooth, stretchy cotton blend for comfort. Made in South Korea. I won't be using them personally but I'm sure they will keep the recipient's feet warm. I love my ice cream socks. Friends, coworkers, & clients have enjoyed them as well. 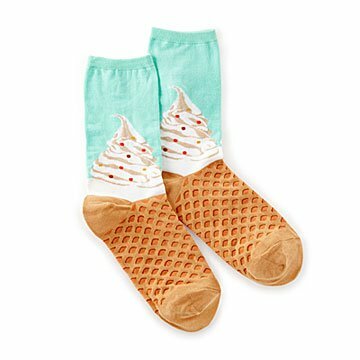 These socks are so cute and will be a total hit with my creemee lover! Wearing it at work at a Children's Hospital for fun for the kids to give them something fun to see and make them smile. Frequently they have little to smile about. It is also a great ice breaker for a scared child and his/her family. Plus it makes me smile.